Baseball’s most talented prospects will go head-to-head in a matchup between the US and World teams. The Futures Games showcases baseball’s rising stars, as 79 past players have played in both the Futures Game and later in an All-Star Game. D-backs legend Luis Gonzalez will skipper the World squad, while former Mets star Mike Piazza will serve as the US manager. Hot-hitting first baseman Paul Goldschmidt and southpaw Tyler Skaggs were selected to represent the D-backs on the US team. 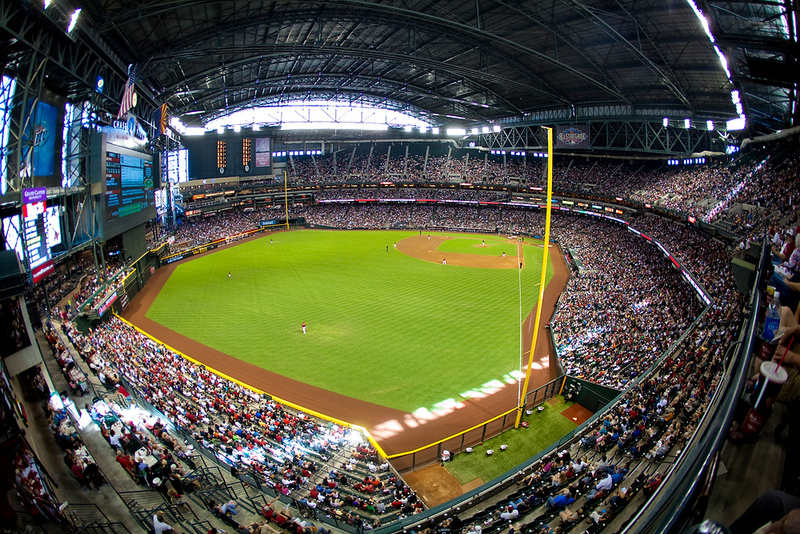 After a standout 2010 season, Goldschmidt’s hot bat has followed suit into the 2011 campaign. Through 82 games at Double-A Mobile, he’s crushed 25 homers, 16 doubles and 75 RBI while batting .312. Skaggs is a former first-round pick of the Angels, who has solidified himself as an up-and-coming left-handed hurler. He owns a 3.23 ERA in 97 2/3 innings of work this season. In his most recent start, Skaggs unleashed seven innings of one-run baseball en route to his fifth win of the season. The Nationals’ Bryce Harper, who was last year’s No. 1 overall pick in the MLB amateur draft, will suit up for the US team. Highly touted Angels prospect Mike Trout and former Arizona State Sun Devil Jason Kipnis are also expected to play. Entertainment stars, athletes and baseball Hall of Famers are set to take the field against one another in the Celebrity Softball Game. From USA Softball’s Jennie Finch and model Kate Upton to Hall of Fame shortstop Ozzie Smith and country music artist Jason Aldean, stars from a variety of outlets will showcase their softball skills. Smith isn’t the only Hall of Famer participating in the game as Ernie Banks, Rollie Fingers, Rickey Henderson, and Goose Gossage are all expected to suit up. Former D-backs Luis Gonzalez and Mark Grace will take the field once again in the event. Arizona Cardinals star wide out Larry Fitzgerald is also expected to play. The softball game will be held on Taco Bell All-Star Sunday following the Futures Game. On Monday, July 11th, eight sluggers will compete in the always-popular Home Run Derby. Recent winners Prince Fielder and David Ortiz are captaining the National and American league teams. Fielder won the 2009 Derby at Busch Stadium, and Ortiz took home the trophy last season in Anaheim. The duo each selected three players to join their team. In addition to Fielder, Matt Kemp, Matt Holliday and Rickie Weeks will compete for the National League. In the American League, Ortiz selected Jose Bautista, Adrian Gonzalez and Robinson Cano as his teammates. The NL players have combined for 68 long balls this season compared to 74 by the four AL hitters. After all the pomp and circumstance heading up to the big event, the All-Star Game itself will kick off Tuesday, July 12th. All 30 MLB teams will be represented as each league battles for home-field advantage in the World Series. Right fielder Justin Upton was tabbed as a reserve outfielder on the National League squad. In his fifth big league season, Upton has been nearly unstoppable at the plate. He’s collected 14 home runs, 22 doubles and 44 RBI. In the month of June alone, Upton batted .382 with a .467 OBP. At age 23, this is Upton’s second All-Star nod after playing in the 2009 game in St. Louis. He also becomes the D-backs’ 29th all-time All-Star selection. For now, Upton is the D-backs’ lone All-Star representative. However, pitcher Ian Kennedy is a part of the Final Vote contest to determine the final two players for each league. Kennedy has been a significant force behind the D-backs’ success this season. He was awarded the Opening Day start and has pitched like an ace all year. Kennedy owns an 8-3 record and 3.38 ERA in 18 starts this season. He’s thrown six or more innings in 14 of his starts. On April 25th against Philadelphia, Kennedy out-dueled Cliff Lee by tossing a complete game shutout in a 4-0 Arizona win.